Effectively stabilize the rising of input pressure. Air source input rising stably increase to ensure safety of equipments. Operation secure and safe. High quality control. 1. Model: SLV-02, SLV-03, SLV-04. 2. Port size: 1/4", 3/8", 1/2". 4. Body material: aluminum die-cast. 5. Shut-off panel material: polycarbonate. 6. 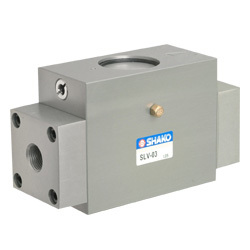 Operating pressure: 0.5~17.0 kgf/cm². 7. Max. pressure: 17 kgf/cm². 8. Cv valve: 4.0, 4.0, 4.0.